You are here: Home / Culver / Suburban Sprawl in Culver? Currently there are three new subdivisions being planned for Culver. One will be part of the Sand Hill Farm development and two others will be part of Culver Meadows PUD. Both are currently winding it’s way through the municipal process. None of these will be traditional grid developments. Grids don’t always work and can be difficult to force onto some topography. But that doesn’t mean they can’t take the best parts of the grid system and reuse them. one being the ties to the community. Sand Hill Farm plans to be connected to Town. It’s main entrance off Jefferson Street will tie into one of the main roads into Town and connects to the planned bike and pedestrian trail. Eventually the main Sand Hill Farm Street will tie back into Academy Road. Culver Meadows plans to continue the trend set by the Riggings and Maple Ridge, by only having entrances on the highway and not tying into existing streets. 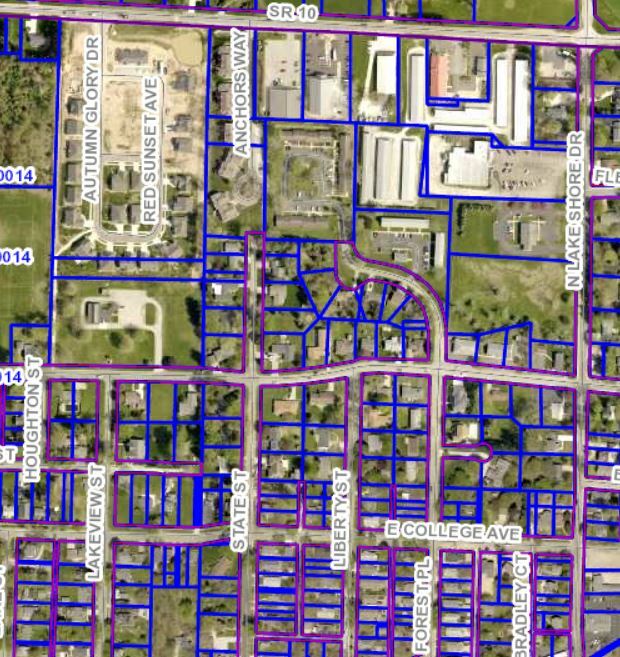 Because of mistakes made by Town officials decades ago and the current favoritism towards property owner rights over community planning, it’s hard to connect streets. Lots were allowed to be created without associated Right-of-Ways. Parcel’s were subdivided without thoughts towards future service expansion. This is the problem currently facing the Town and Culver Meadows. Culver’s Comprehensive Plan calls for the extension of Academy Road through to State Road 17. (The Comprehensive Plan also calls for the extension of West Shore Drive from the intersection with Main Street, west to State Road 17.) Unfortunately, despite that being the correct thing to do, supported by Town residents in the Planning Document, the tools to make this happen aren’t available and the home owners affected are adamantly against it. So against it that another problem is being created; we will soon see these residential properties as islands of “County” surrounded by Town. They will continue on septic systems and wells while surrounded by the Town’s utility system and eventually, when their systems fail, it will be extremely expensive for them to connect to the system. In my typical round-about way, what I’m getting at is a concern about “community”. I’m a big proponent of additional housing for Culver, at whatever scale and price point that can be supported. It’s an obvious need in Culver, again as supported by the community in the Comprehensive Plan. My concern is that if we allow the new housing to essentially turn it’s back on the Town. Will these new residents make connections and become part of the Town or are they the equivalent of gated communities, separate from the Town itself? It’s an interesting conundrum because both sides are fighting it. This is not a new phenomenon in Culver. State Street is a dead end street. It doesn’t have a cul-de-sac on the end of it because the original plan was to extend it north to State Road 17. When The Riggings was proposed, residents on State Street and The Riggings developer both protested making the connection because they didn’t want the additional traffic. Forrest Place doesn’t have a cul-de-sac on the north end. It was planned to extend to State Road 17 as well, but the property north of Forrest Place was allowed to be subdivided without providing Right-of-Ways and now Forrest Place dead ends into the apartment complex there. Residents in those areas are happy, but was this the best decision? North bound traffic is not concentrated on Lake Shore Drive and on School Street. Neither are the best routes for this.